The International Monetary Fund (IMF) board of directors signed off on Ukraine’s new $17.5 billion package of financial aid Wednesday, IMF chief Christine Lagarde has announced. Lagarde however did not provide details on how large an initial payment will be made to Ukraine or on what timetable. "This new four-year extended arrangement will support immediate economic stabilization in Ukraine," she said. 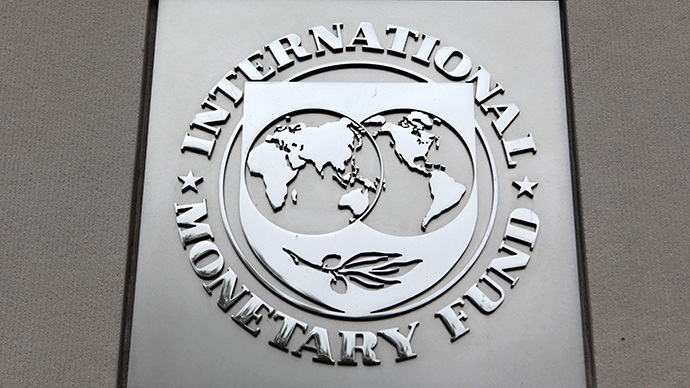 The first immediate payment from the IMF will consist of $5 billion, Ukrainian Prime Minister Arseny Yatsenyuk announced at a cabinet meeting on Wednesday, RBC Ukraine reported. He also said the newly approved financial help would allow Ukraine to receive $7.5 billion in other loans. "It will give the Ukrainian economy an opportunity to grow already in 2016," Yatsenyuk said. But according to the IMF chief, the move – which aims to provide economic stabilization for the country – is still risky. "The program is ambitious and involves risks , notably those stemming from the conflict in the east of the country,"Lagarde said. At the same time, Lagarde said the IMF is blocked from making loans to countries in a state of war. That means the fund contradicts itself in making concessions to Ukraine, financial analyst and commentator Michael Hudson told RT. The main condition for allocating a loan by the IMF is the country’s sticking to austerity measures, which never increase live standards, he said. In February, the IMF pledged the multibillion aid package to Ukraine over the next four years in additional to the $17 billion aid package in April 2014. Without the IMF funds, Ukraine’s economy would likely collapse, as the economic situation is very fragile. Despite a ceasefire, bursts of fighting continue in the country’s east, and Kiev continues the costly war against anti-government forces. Ukraine’s economy is expected to contract five percent this year, as about seven percent of its territory has either joined Russia or is engulfed in civil war, despite two separate ceasefire agreements. Kiev has allocated more than five percent of its 2015 budget to defense spending. Ukraine’s central reserves have fallen dangerously below $5.5 billion, and the national currency, the hryvnia, has lost more than half its value in 2015. The weakening currency has led to massive inflation, which has reached 272 percent by some estimates. Officially, it was 34.5 percent in annual terms as of February. Ukraine also has outstanding Russian energy debts it must pay if it wants to continue receiving natural gas. In return for the IMF funds, Ukraine has embarked on tough economic reforms, which include cutting pensions, raising the retirement age, trimming the state budget, and getting rid of wasteful gas subsidies. Slashing subsidies will be painful for households, who could see their heating bills more than triple. The government is also taking steps to prevent tax fraud and corruption. In addition to IMF funds, the US has guaranteed $2 billion in Eurobonds, the EU has promised a €2.2 billion loan, and other Western allies - Germany, Japan, and Canada - have also pledged multimillion dollar aid packages. This brings total aid to Kiev, including IMF funds, to more than $40 billion. Ukraine has to pay about $10 billion to service its debt this year, including corporate and sovereign loans and bonds, according to the Institute of International Finance, a financial group based in Washington.